When I was younger, we lived on a crop and cattle farm about five miles north of a little town named Martinsburg. We would occasionally get a dime here and a quarter there from relatives, or for some small job accomplished. The main thing we worked for, and saved our money for, was that once-in-a-blue moon trip to town that also happened to coincide with the point at which we had saved enough money to buy ourselves some candy. These days our kids seem to always have candy on hand, or it’s at least easily accessible. But for a farm kid with frugal parents in the 1980’s? Not so much. Let’s just say my brother and I could identify pretty closely with “The Little House on the Prairie” TV show, where half-pint gets one piece of candy a year for Christmas, along with a tin cup of her very own. My parents would probably argue with me, but I’m stickin’ to my guns on that one. Mostly because it’s my only excuse for the fateful decision that led to this story. In the summer of ’85 I was eight and three quarters and my brother, Patrick, was almost ten. That summer it was hot and humid and while Dad was on the tractor or the bulldozer all day, my mom was at work at her town job. This left our older sister Kristy, then 17, to watch over us. Always an incredibly responsible and hardworking person, she had decided on a particular weekday that she would tackle the job of cleaning out the attic for my parents. We were to assist her with this tremendous task, but it was a hot, dirty job and it wasn’t long before Patrick and I had grown fairly disinterested in helping our angelic older sister, and we decided to look for some fun. We had only to look as far as our piggy banks for an idea. I still remember it to this day. We walked into our shared bedroom and I picked up my piggy bank and shook it, and remarked that I finally had enough money to buy a stash of candy, if only we could get to town. Pat claimed that he did too, and suggested that we should just go to town by ourselves. While our sister was distracted with sorting through things to be thrown away, given away and kept, we quickly hatched a plan. Within five minutes of shaking that piggy bank we had our pockets full of coins, a two liter bottle of water to drink and were halfway down our quarter-mile long driveway on the way to town. Without our sister having even the foggiest idea that we were gone. I remember us stopping to argue at the end of the driveway when we reached the blacktop. I wanted to go back and get my pony but my brother kept insisting that we couldn’t both ride her and she would be too much trouble. I looked back down the long expanse of our driveway and concluded he was right. And just like that, we were on our way. We knew the way well enough, and walked on the shoulder of the asphalt road, meeting only a couple of cars on our way. I’ve been asked, but I can’t say that it ever crossed our mind that our sister might worry about us, or that we would be found to be missing. 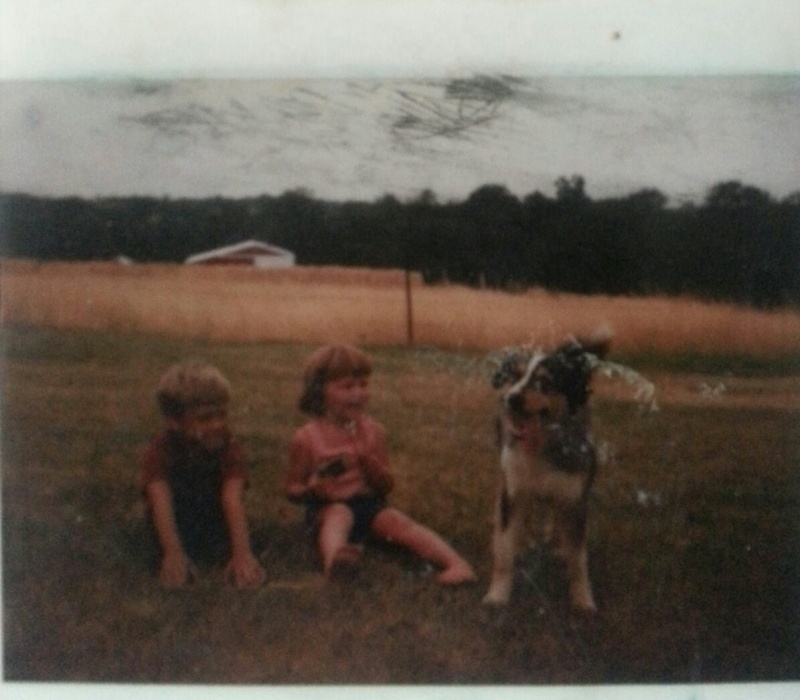 We were rough-and-tumble farm kids with several hundred acres to roam, and we weren’t used to “checking in” with our parents periodically, or with the idea that someone might wonder where we had went. Summer days were spent exploring and playing, and when we got hungry, we came home. It was as simple as that. Three things eliminated 90% of our parent’s worries; we had each other, we both could swim well, and we had our trusty blue merle Australian Shepherd, Mickey, faithfully guarding us wherever we went. But little did the parental units know that this day was special. This day, we were going to get CANDY. The five mile walk to Martinsburg seemed to pass in a blur, with our excitement palpable. Every step we took was one more step toward the Valhalla of our pre-adolescent farm lives… CANDY. We must have left fairly early in the morning, and reached the little store in Martinsburg a few hours later. I forget what kind of candy we spent our money on, but I do remember walking into that little air-conditioned store with all the proud swagger of a pro-wrestler. I also remember being glad I had my big brother to help me figure out how much candy I could buy, and once our pockets had been emptied of our jingle, and replaced by various types of candy, we headed back out the door, where Mickey awaited our next move on the front porch. We made a bee-line for the park that we loved, and spent the entire day glutting ourselves on candy, and wearing ourselves out on our favorite playground equipment. At one point our older sister’s friend Patti was driving by the park and stopped to say Hello to us. She was a bit suspicious at finding us in the park by ourselves, but we tried to pretend we were supposed to be there, and eventually won her over. I proceeded to make myself completely and totally sick on candy, and about the time I thought I was going to thrown up, my brother Pat suddenly looked up at the sky and told me it was going to be dark soon, and we needed to get home. I wasn’t looking forward to the walk, as I was seriously green around the gills, but there seemed no alternative; so leaving a trail of candy wrappers and an epic day behind us, we finally turned back toward home. We didn’t get more than a mile from town before it was nearly full dark and we realized we had totally misjudged how long the walk would take us, and how much light we had left. We were fortunate that it was a bright night, and we opted to stick to the road to find our way home. Close to half-way there, we had to pass by the Martinsburg cemetery, which was spooky enough in itself, but matters were made worse when our ever-faithful dog, Mickey suddenly ran barking off into the adjacent woods! I looked once, then twice, my brother mentioned seeing ‘something’ floating among the gravestones, and I looked down confused at why there seemed to be a darker line in the dirt all around my feet. I suddenly realized I was standing on a fresh grave! I thought I was pretty brave and tough, but I wasn’t brave and tough enough for all three of those triggers, and I sprang off the level ground, right into the ditch and hit the road running for all I was worth, not even checking to see if my brother was with me. I needn’t have worried…he most certainly was. By the time we ran out of steam and Mickey caught up to us, we were both a little scared, very tired, and realizing how far we still had to go, before we were home. We started talking about how much we wanted to just get home, and how we didn’t think town had been worth it. And that’s when we saw the headlights. Our momma in her big blue oldsmobile suddenly pulled up beside us, and I only caught a glimpse of my sister’s tear-streaked face in the passenger seat as we were both bodily hauled up and thrown in the back seat! Being a loyalist to the end, I did try to protest that Mickey J. Dog should get a ride home, too. As I’m sure you can guess, my mother’s fear had turned to anger on sight of us, and although she was typically a softie where Mickey was concerned, I knew we were in BIG trouble when she snapped that Mickey could find his OWN way home. Tucked into bed that night, the fun of the day vanished as we realized how badly we had scared our parents and our sister. Sometimes life lessons just have to be learned a certain way, and that day we certainly became more mature, as we realized that sometimes, town isn’t all it’s cracked up to be, candy really isn’t all that great, and maybe home was really everywhere we wanted to be, anyway. Patrick, Me and Mickey J. Dog right around the time of this story.